Welcome back to ThaiPod101.com’s learn Thai in three minutes. The fastest, easiest, and most fun way to learn Thai. Hello. My name is Rawinporn. Hello. My name is ศุภชัย(Sùphàchai). 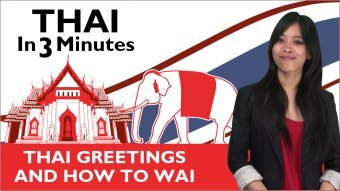 In this lesson, we’ll learn how to greet and “WAI” in Thai. It is SUPER easy and you’ll learn them all in THREE minutes. First, we have สวัสดี(sà-wàt-dii…) สวัสดี(sà-wàt-dii) which is equivalent to “hello”. And you know what… สวัสดี(sà-wàt-dii) can be used at any time of the day. Yes, it is SUPER easy. And now, I’m going to explain what “WAI” is! “Wai” is not only a gesture used to say hello but also a sign of respect. Most of the case, younger people do “Wai” to people who are older, higher in status or to people you respect. There are three levels of “Wai”. Are you ready!!?? The first, in order to “Wai” monks, priests, and royal family, pressing your palms together near your chest, then, lower your head and raise your hands until the thumbs touch the middle between eyebrows, and bow at the same time. Next, how to “WAI” highly respected people, for example, teachers, or parents. How to do is pretty similar to the previous one. However, your thumbs must touch your nose and index fingers touch the middle between your eyebrows, then bow at the same time. Last but not least, how to “WAI” older people or people with the same level. The same as before but the index fingers touch your nose. There you go! Now it’s time for Rawinporn’s hint! I’m sure you are a master in Thai greetings now. In next lesson, you will learn more about the greeting “How are you?” and how to answer this question. Thank you very much for your comment and shared experience with us here. I would recommend to not "wai" the services staff, such as cabin crew, receptionist or waiter and waitress before they "wai" you. You just "wai" them back after they "wai" you by just put your palm together on your chest and bend your body a little bit, also for people who younger than you. You should do the "wai" to older people you respect, to say hello, goodbye and thank you. Hope that's help. Please let me know if you have any future questions. I will be glad to help. We wish you will have a good progress with Thai. It's interesting, I have been to Thailand quite a few times and I've always appreciated being "wai"-ed; however it feels quite awkward when I do it and maybe that's because I was simply overdoing it. My friend would wai everytime a waiter/waitress would serve his meal and so on. I used to be the same but I stopped doing it as I felt awkward (we're both french). Thank you very much for your comment and question. Yes, this is "how to great people in Thai language. If you visit you will always hear people say sà-wàt-dii khráp, sà-wàt-dii khâ and do the wâai posture with respectful smile. Please let me know if you have any future questions. I will be glad to help. We wish you will have a good progress with Thai. This is not really learning the thai language is it? Thank you very much for your comment and question. We will be happy when you do the "wai" to us, I don't think any one will find it offense because of your fingers. Please let me know if you have any future questions. I will be glad to help. We wish you have a good progress with Thai. I like that, how and when to wai helps a lot, and it seems a natural thing to do. However, I have a damaged 3rd finger on my left hand (I can't straighten it) and that means I can't press my palms together if I touch finger tips and my wai looks odd. Best I can do is to interleave the 3rd fingers. Would that be acceptable or cause offense? Thank you very much for your comment. For your question, no we do not do the "wái" to our friends/close friends. Let me know if you have any future questions. I will be glad to help. Very informative video, thank you so much for this. I do have a small question though; are you supposed Wai friends/close friends the same way as those of equal status/elders (index fingers to nose)? Keep it up and let us know if you have any questions! Wow...really informative :wink: I thought there was only one type of wai; I wouldn't have noticed the subtleties if it weren't for this clip...thanks Rawinporn!